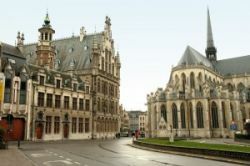 Belgium is known the world over for being one of Europe’s most exciting and affluent countries. It offers a brilliant historical and cultural atmosphere complete with amazing food and drink. So making a move to Belgium can be a really rewarding, exciting experience for those wanting to make a change. Indeed, modern Europe is already so open that it may feel, almost, like moving next door as more and more metropolitan areas arise. It is a big step for many to take, moving abroad, so you will only want to hire real professionals who are sure to make your international home removal so easy. There are already a million things to organise when moving abroad and with our service you need not carry out the back breaking physical work yourself. Now that you have decided to go through with your international move to Leuven we hope that you will consider hiring us, the professional international home removals company, at Moving Service. We have already helped hundreds of people to make their moves and would love to add you to our ever growing client list. So if you want to take all the stress out of moving to Belgium then give us a call on 020 8746 4402. A member of staff will be able to provide you a free quotation of our services and we are sure you will agree that our prices are second to none. Not only are our prices extremely low but our services are top quality. We only used trained professional movers to help our clients. Their expertise ensures that all of your goods arrive in Leuven just the way in which they left London. They use high quality vehicles and packing materials coupled with years of experience to assure you that this happens. We can help you move mountains or molehills to your new home in Leuven with ease. Many families prefer to purchase a lot of their goods and furniture upon arrival and so only have a few things that they wish to take with them. For these people we offer our man with a van service to get their essential items to their new home. Others prefer to move their entire life with them to Belgium, not wanting to leave a single thing behind. And for these situations our international house removals team is perfect. They use all of their man power and expertise to make your international home removal easy. Not only that but they ensure that all of your possessions are well looked after in transit which we know is always a big worry for our clients. Because there is so much to think about and do during an international removal, we want to take the strain off our clients and allow them to fly out to their new homes in comfort rather than undertaking endless driving, packing and unpacking. So no matter what size removal service you need, you can be sure that we will be here to help. When you are ready to hire the professional home movers company Moving Service, we are ready to assist you. Our service is flexible both in terms of time and services available. If you want to relocate a lot of your possessions then hire our dedicated, diligent team of international home removals experts. Alternatively, if you only have a small amount to pack and take then our man with a man service could be just what you are after. Whatever your need and whenever you need to go, we are ready and waiting to take your call right now on 020 8746 4402.